The Rotary Club of Saline ("Saline Rotary") is a service club engaged in service activities in the Saline area, and internationally, through its partnership with Rotary International. Bill Crispin Chevrolet, Inc. (“Bill Crispin”) is a Michigan Domestic Profit Corporation engaged in the business of selling and servicing automobiles in the Saline/Ann Arbor area. 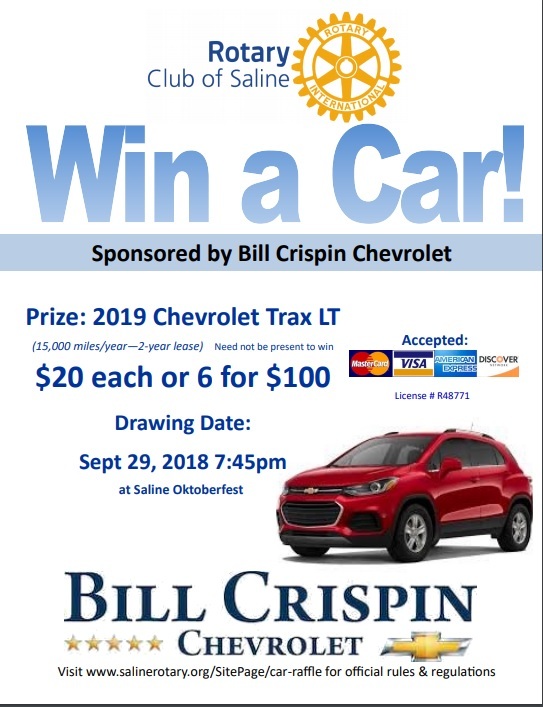 The Saline Rotary Car Raffle, sponsored by Bill Crispin Chevrolet, ("Raffle") is conducted for the purpose of generating operating funds to support the charitable activities of Saline Rotary. Each entrant, by entering the Raffle, agrees to abide by all of the rules and conditions contained herein, as well as all applicable local, state and federal laws and regulations, and further agrees to release Saline Rotary and its directors, advisors, officers, agents and employees from any and all liability with respect to all aspects of the Raffle including, but not limited to, the selection process. The Car Raffle is open to any eligible person residing in Michigan or a cash prize is being made available to entrants from other states where the Raffle is not prohibited by state, local or other laws. Members of Saline Rotary, and employees of Bill Crispin Chevrolet are ineligible. The cost to purchase a single entry ("Ticket") for the Raffle is $20.00 (U.S. Funds only), or six entries for $100.00 (U.S. Funds only), and is not tax deductible. Any entrant may purchase more than one Ticket. An entrant can enter the Raffle by purchasing a Ticket from any member of Saline Rotary, or at various locations where tickets will be sold throughout the summer of 2018. Ticket payment can be made by VISA, Mastercard, Discover Card, check or money order. Saline Rotary, Bill Crispin, and their staff, agents, Board, vendors, volunteers, and members assume no liability for lost, late, misdirected, mutilated, incomplete, illegible, undelivered entries or entries without proper payment received, which entries shall be deemed invalid and shall be immediately disqualified. If an entrant's payment is dishonored by a bank for any reason, such entrant's Ticket will be declared invalid unless full and satisfactory payment is made prior to the Raffle drawing. Any dishonored credit card will be considered an invalid entry, and Saline Rotary will endeavor to notify the entrant by mail. Completed entry ticket forms must be in the possession of Saline Rotary by 7:00 p.m. (Eastern) on Saturday, September 29, 2018, or before 1,200 valid Tickets are sold, whichever comes first, to be eligible for the Grand Prize drawing. All ticket forms will be handled and recorded on a first come, first served basis. Any ticket forms and payments (including payments previously dishonored) received after closure of the Raffle will be returned to the entrant. Upon receipt of a completed registration form and valid payment, a Ticket with assigned drawing number will be issued. The Ticket shall be delivered to the entrant at the time of sale. All purchases of Raffle Tickets are non-refundable after an entry has been included in any prize draw, unless the Raffle has been cancelled under the terms listed in Section 6 below. If the Car/Cash Raffle is not modified or canceled under the terms of Section 6 of the rules, Saline Rotary will award one (1) grand prize to the lucky winner. In the event that a winning Ticket has more than one (1) name listed, Saline Rotary will award the prize to the first name listed on the entry. The records of Saline Rotary shall be deemed correct if there is a discrepancy or dispute. Saline Rotary is not responsible for resolving any disputes that may arise from different individuals listed on a valid Ticket. Any and all prizes inure only to the designated winner and may not be transferred, sold or otherwise made available to another party. GRAND PRIZE. The Grand Prize is a 2-year, 12,000 mile/year lease on a 2018 Chevrolet Trax LT model. The Chevrolet Trax is more fully described at Chevrolet’s website. The Chevrolet Trax is provided by Bill Crispin Chevrolet (Bill Crispin). The winner is fully responsible for costs associated with title, licensing, registration, transportation, delivery and other fees, and local, state and federal taxes, including without limitation all applicable sales, use, luxury, income and special taxes, as well as all-risk motor vehicle insurance, proof of which must be provided in writing prior to delivery. In the event that the winner is unable to satisfy the responsibility for any of the above-listed fees or obligations, or the winner is unable to otherwise satisfy the requirements for leasing a vehicle, in the sole discretion of Bill Crispin, the Grand Prize winner will be awarded a $5,000.00 cash prize. If the vehicle prize option is awarded, the Grand Prize winner must take delivery of the vehicle at Bill Crispin, a Chevrolet dealer whose address is 7112 East Michigan Avenue in Saline, Michigan 48176. Saline Rotary will not act as agent on behalf of the winner in arranging final delivery. Timing of the delivery of the vehicle to the dealership is at the discretion of Bill Crispin. The awarding of the 2018 Chevrolet Trax is subject to availability at Bill Crispin. Given that this model may be in high demand, delivery may take time. If the 2018 Chevrolet Trax is unavailable, Saline Rotary and/or Bill Crispin, at their sole discretion, may substitute another vehicle lease of similar value. The choice of the substituted, replacement vehicle is solely at Saline Rotary /Bill Crispin’s discretion. If Saline Rotary/Bill Crispin chooses not to substitute a replacement vehicle, the Grand Prize winner will be awarded a $5,000.00 cash prize. A maximum of 1,200 Tickets will be sold. Each Ticket represents one chance to win. You may enter as many times as you like. Chances of winning a prize depend on the number of eligible Tickets sold. For the Grand Prize, if 1,200 tickets are sold, your chance of winning the grand prize is 1 in 1,200 with one ticket purchased. The actual odds of winning a prize in any drawing are dependent on the number of eligible Tickets sold and available for the drawing. Winner will be determined by random drawings of all the eligible Tickets received by the entry deadlines. The Grand Prize Drawing will be announced at Saline Oktoberfest event held on Saturday, September 29, 2018 at 7:45p.m. for all valid tickets received by 7:00 p.m. on Saturday, September 29, 2018. The Grand Prize Drawing announcement will be posted to SalineRotary.org immediately following the drawing. Winners need not be present to win. 6. MODIFICATION OR CANCELLATION OF DRAWING. Saline Rotary and Bill Crispin reserve the sole right to cancel or modify the Raffle. If less than 600 tickets are sold by 7:00 p.m. on Saturday, September 29, 2018, Saline Rotary, at its sole option, may modify the Raffle by awarding the Grand Prize winner a $5,000.00 cash prize. If ticket sales are below 500 tickets at the same time this raffle shall at the sole option of the Saline Rotary become a simple 50/50 raffle where 50% of the funds collected will be paid to the winner as a cash prize. Winner will be notified by phone, e-mail or by mail based on the information received on the Ticket. Winners' names, city and state will be available to all media and will be available on Saline Rotary's Website. For a list of winners, send a self-addressed, stamped envelope to Winners List, Saline Rotary, P.O. Box 121, Saline, MI 48176. Winning entrants agree to allow Saline Rotary and /or Bill Crispin to use their names, likeness, and any statements made by them regarding the prize for advertising or publicity purposes without compensation. Winners may be required to complete and return an affidavit of eligibility and/or liability release and required tax forms, and must submit their social security number to Saline Rotary/Bill Crispin for that purpose. A winner's failure to do so if requested or if one otherwise fails to comply by these rules and/or to make arrangements to claim his or her prize within ninety (90) days of a drawing notification will void that entry. If a winner cannot be contacted or located by reasonable means after a period of ninety (90) days from the date of any Raffle drawing, the prize will be deemed forfeit and shall be considered to have been donated to Saline Rotary for its charitable purposes. While more than one name may be listed on a Ticket, only the first name listed shall be deemed to be the entrant. Delivery or payment of any prize shall be made solely to the entrant. All prizes inure only to the designated winning entrant and that person may not be transfer, sell or otherwise make the prize available to another party. The entrant of a multiple party entry has the sole and exclusive responsibility to allocate any such prize among the participants in a multiple party entry. Saline Rotary and Bill Crispin bear no responsibility for such matters. The decision of Saline Rotary shall be final in all matters concerning the Raffle. The Raffle is subject to the laws of the State of Michigan. The Raffle is void where prohibited by law. Saline Rotary and Bill Crispin are not responsible for any errors or omissions in the Raffle's advertising and/or any printed, broadcast, or Internet-provided materials or information. Saline Rotary reserves the right to modify and/or amend the official Raffle rules without notice at any time. To view rules online, go to www.salinerotary.org/SitePages/car-raffle. To receive a copy of the rules via mail send a self-addressed stamped envelope to Saline Rotary, P.O. Box 120., Saline, MI 48176. Waiver/Limitations of Liability. Ticket purchasers, by participating, and winners, by accepting a prize, release Saline Rotary, Bill Crispin, and their respective board, staff members, volunteers, partners, vendors, agents, representatives, sponsors, service agencies, and independent contractors, and each of their respective directors, officers, partners, employees and agents, including advertising, public relations, direct marketing and promotion agencies, from any and all liability with respect to participation in the promotion and possession or use of the prize(s) awarded and also acknowledge that they did not receive any representations, warranty or guarantee, express or implied, in fact or in law, relative to any prize, including but not limited to its quality, mechanical condition or fitness. Any liability of Saline Rotary and/or Bill Crispin shall be limited to ticket price paid and in the case of any dispute, Saline Rotary's decision shall be final. Saline Rotary reserves the right to modify or amend the Official Raffle Rules without notice at any time. For the official Raffle rules, go to www.salinerotary.org/SitePages/car-raffle or send a written request with a self-addressed, stamped envelope to Saline Rotary, P.O. Box 120., Saline, MI 48176.